Canine hip dysplasia is a genetic issue that starts to appear in our pups from four to twelve months old. Not all puppies in a litter will develop it if one pup happens to have the ailment. In its more severe form, hip dysplasia can lead to arthritis. Larger breed dogs have a higher risk of developing hip dysplasia, due to the greater weight these joints will have to bear. However, some small dogs can be affected also. The symptoms of hip dysplasia usually are walking with a limp, a swaying gait, bunny hopping when running, difficulty in the back legs when getting up, or pain in the hip. In a puppy, you can see that his or her back legs can not extend towards the front legs without pain. The only way to find out if your dog definitely has hip dysplasia is if he has an x-ray by your veterinarian. Canine hip dysplasia is an ailment that affects the ball and socket joint of the hip when the large bone in the dog’s leg doesn’t fit snugly into the hip socket. Therefore if the socket itself is not well developed, it can create a lot of stress on the joint. The muscles don’t develop as quickly as the bone grows and a situation is created where the weight the joint has to bear is greater than the capacity of the ligaments, tendons, and muscles around the joint. Therefore, joint instability develops which leads to a greater wear and tear on the joint. 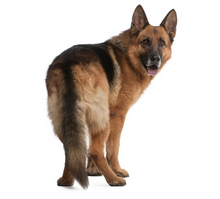 Canine hip dysplasia ranges from mild to moderate. In mild cases, the space between the joints is greater than normal and the ball at the top of the hip bone is part way out of its socket. Fortunately, in mild cases, there are no associated arthritic changes in the joint. In moderate canine hip dysplasia, the top part of the normally rounded hip bone begins to flatten and sits only loosely in the joint. Bone spurs can start to develop and arthritic changes start to happen. Unfortunately, in severe hip dysplasia, there is definite arthritis. And once arthritis appears in the joint, the condition is irreversible. In severe cases such as this, the hip bone is completely out of the joint. The silver lining is that not all dogs with hip dysplasia and arthritis will become immobile. If you keep a puppy in good shape and feed him or her a diet without too many carbohydrates or calories, this can help prevent hip dysplasia. 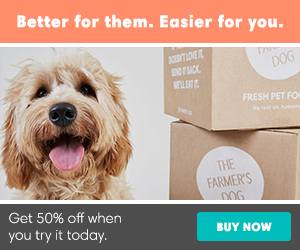 It’s important that a growing dog’s nutritional needs are met, but excessive weight and rapid weight gain can add more of a load for the joints to bear. If a dog is genetically predisposed to hip dysplasia, this can delay the beginning of symptoms or reduce the chance of it developing into a more severe form. On the flip side, be mindful about the type of exercise growing dogs get. Jumping up and down from heights and standing on their back legs can aggravate the joints as they are growing quickly. If you notice your dog having an issue with any kind of jumping or exercise, think of different ways to get your dog a good workout and/or to avoid these types of jumps. I hope that your dog never has canine hip dysplasia, but if he or she does, you can certainly moderate diet and exercise to help your dog adjust to the condition.